The diagram above (from manual therapist Erik Dalton – www.ErikDalton.com) does a nice job of illustrating how the head can migrate forward in our flexion-obcessed world. In todays post, I’ll explain why you should care (so many reasons, both in regards to your golf performance, and your overall health, wellness and vitality). And then, of course, I’ll give you a specific game plan to stop (or even reverse it) from happening to YOU. Golfing buddies don’t let each other get 42 pound heads! 1) You’ll eventually look like a mutant, and the golfers in your foursome might try to set their drinks on your upper back. 2) Chronic tension and stress on your neck and shoulder complex (trust me, if your head is forward, you have tension and discomfort. 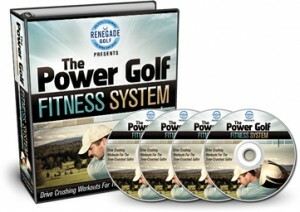 You may have gotten used to it over the years, but you’ll be amazed how much better you can feel and swing your clubs). 3) Decrease up to 30% of your lung capacity, and especially limits your inhalation abilities. 4) Increased aging of your spine which leads to degenerative joint disease. 5) Can neurologically inhibit peristaltic action and lead to constipation – see Are You Full Of Crap? 6) As we’ve talked about many times, flexion restricts rotation in your golf swing, which can lead to injuries in your low back, shoulders, elbows and wrists. 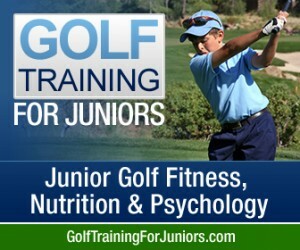 Bottom Line: Your body will feel unnecessarily tired and painful, you will wreck your spine, shorten your golf swing and eventually get injured. 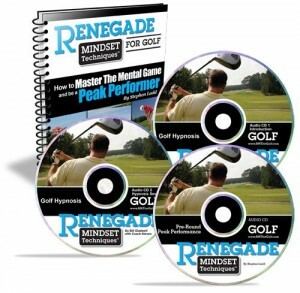 I am going to outline 4 main areas of focus for you in terms of preventing or reversing Forward Head Posture (FHP). Note: Please get clearance from your medical professional before attempting any of these suggestions. Although most will be fine for the majority of golfers, you should always be conservative when working with your neck. FYI – Anterior neck work isn’t a walk in the park, but the benefits are well worth it. There are a couple of exercises to actually strengthen the muscles in your neck that get weak from extended periods of time in FHP. This will make it much easier for your head to settle back over your shoulders. Today I’ll introduce you to one of the more gentle exercises, and then I will create a video with several more in the coming months. 1) Best to perform this on a semi-soft surface, such as a mattress, lying on your back. 2) Gently press the back of your head into the mattress, and at the same time pull your chin in. Basically flattening your neck and giving yourself a double-chin. 3) Hold this position for 10 seconds, then relax completely for 10 seconds. Perform up to 10 reps, once per day. 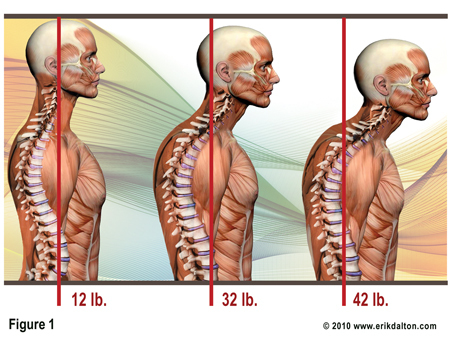 Once you have restored the quality of your neck tissues, strengthened the weak muscles, and are breathing properly, you still have to have some awareness of your posture. All the bodywork and exercises cannot compete with sitting at a desk for 8+ hours a day in poor posture. Sitting is by far the most damaging daily activity most of us do for our body and golf game. In many ways, we are sitting ourselves to death! However, you can reduce the number and magnitude of these consequences by understanding and implementing the strategies in this Free Office Ergonomics Special Report , courtesy of The CHEK Institute. That’s All Folks…. (for now). Get your head on straight… And Get After Old Man Par! Next post: Golfers, Who Has Your Back… And Shoulders?